Look...I'm not a guy in any kind of shape to be criticizing anyone's weight. I'm a chubby man...slimming at the moment...but still far too overweight. However, I'm not an NHL defenseman, and I'm not making $5.2 million a season. 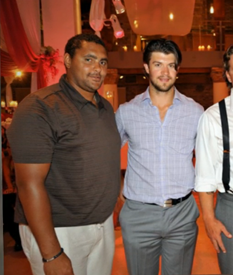 Winnipeg defenseman (and former Blackhawk) Dustin Byfuglien, who has struggled with weight during his entire career, was photographed this summer (with Brent Seabrook) at Dave Bolland's July 13th wedding. To say he's not in playing shape would be an understatement. Somehow, Buff has always found a way to get in shape in time for camp, and it's safe to assume he's much slimmer today than he was two months ago, but if I'm a Jets GM, Coach or player, I'd certainly be concerned.